Francis McComas (1875 – 1938) was an Australian painter who discovered the Monterey Peninsula before the turn of the century and for several decades he was one of its most honored artists. While his paintings were not always large, his conceptual vision was, and his works are characterized by weighty, well-defined masses unencumbered by extraneous detail. While most of his early works were painted in a subdued Tonalist palette, McComas could be bold and modern in his approach to the landscape, setting him apart from most of his contemporaries. He was a raconteur with an outgoing, engaging, personality. McComas was born in Fingal, on the Island of Tasmania in 1875, but he moved to the Australian mainland to study art, first at Sydney Technical College and then Sydney’s Academie Julian with Julian Ashton (1851-1942). Ashton was an English-born painter who had opened his own school in 1895 and patterned it after the Parisian academy of the same name. He served as teacher and mentor to the young Tasmainian as well as to a generation of Australian painters. Ashton is credited for introducing the Barbizon influence and practice of plein-air painting to the Antipodes. After his studies, McComas traveled to California via Samoa and Hawaii, sailing through the Golden Gate in 1898. The Australian was a driven man. Soon after he arrived in California he was painting watercolors on the Monterey Peninsula and within months he had the first of many exhibitions at the Vickery Gallery in San Francisco, a show that consisted of works from the South Seas and the California coast. His paintings, spare, yet beautiful, sold well. 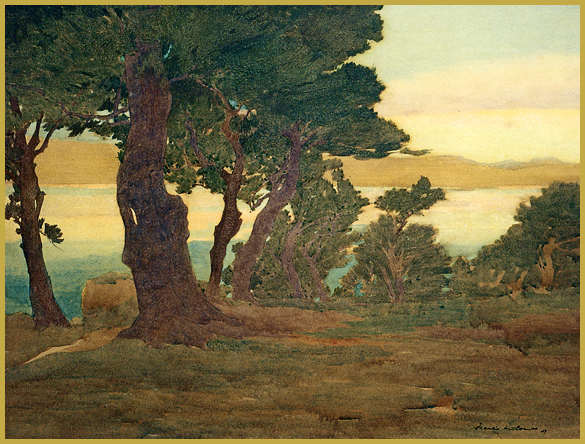 In 1898 while traveling with Alexander Harrison, who was staying with Charles Rollo Peters in Moneterey, he began to adopt a greyer palette and fell in love with the subjects that he found along the coast and in Carmel Valley. McComas soon became known for his haunting watercolors of the Monterey Cypress and California Live Oaks that dotted the hillsides of the region. By 1904 his paintings were selling in Chicago, Boston and New York as well as San Francisco. McComas had a wanderlust and he traveled extensively, returning to Europe in 1904 with his friend Arnold Genthe, the Pictorialist Photographer. Upon his arrival back in California he opened a studio in Santa Barbara, enabling him to paint the coast and the rolling hills of the Santa Ynez Valley. In 1905 he was successful enough to marry his finance, the young socialite Marie Louise Parrott. The couple visited Monterey on their honeymoon, visited Santa Barbara and then spent much of the next few years traveling on the continent. In 1909 McComas opened a beautifully appointed apartment and studio decorated in pared-down Arts and Crafts style on San Francisco’s Post Street and his atelier became a rendezvous for the artistic set. 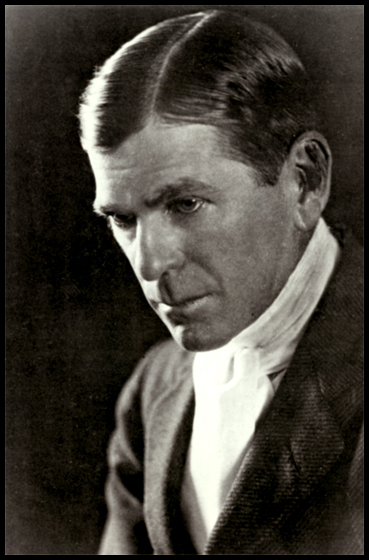 In the summer of 1909 McComas was diagnosed with tuberculosis. When he went to the dry Arizona desert to recover, he found the Indian ruins and the monumental canyons to be a colorful new subject that inspired him as a painter. In 1911 he had an exhibition at the prestigious Macbeth Gallery in New York and in 1913 his works were in included in the famous Armory Show where the American and European avant garde had its coming out party. That same year McComas began an affair with Gene Baker, a younger artist who was a student of his friend Xavier Martinez and the relationship doomed an already troubled marriage. The 1915 San Francisco World’s Fair – the Panama Pacific International Exposition – was a great triumph for the Australian and an entire gallery was devoted to his works and he was a favorite of the jurors. The painter married his paramour in 1917 and the couple moved to the painter Charles Dickman’s (1863-1943) old atelier in Monterey. By 1924, McComas and his wife moved into a comfortable home and studio in Pebble Beach. On the peninsula they were part of the artistic community that revolved around the arts organizations and the Hotel Del Monte and Gallery. In the 1920’s there were major exhibitions and still more trips, to Cuba in 1924 and to Tahiti in 1927. In 1932 there was a commission to paint murals at the Hotel Del Monte, a fortuitous event for by then the Depression had taken hold and because tastes had changed, sales were less plentiful. In 1938 Francis McComas, the man with a spirit a indomitable as a Monterey Cypress clinging to a rocky cliff died, forty years after his arrival in California. Copyright 2008-2011, Jeffrey Morseburg, not to be reproduced without specific written permission of the author. Have a McComas You Need to Have Evaluated? This entry was posted on Wednesday, June 8th, 2011 at 08:25	and tagged with Alexander Harrison, Arnold Genthe, Artists from Australia, California Watercolorists, Del Monte Gallery, Francis McComas Appraisals, Francis McComas Biography, Francis McComas Paintings, Panama-Pacific Exposition, Purchasing Francis McComas, Santa Barbara Artists and posted in California Watercolorists, Monterey Peninsula Artists, Northern California Artists, Plein-Air Painters of the North. You can follow any responses to this entry through the RSS 2.0 feed.